The Income Tax department through the Central Board of Direct Taxes (CBDT) issued a circular regarding the limits on House Rent Allowance deductible. The circular which was issued by CBDT vide its Circlular No. 08/2013 F.No. 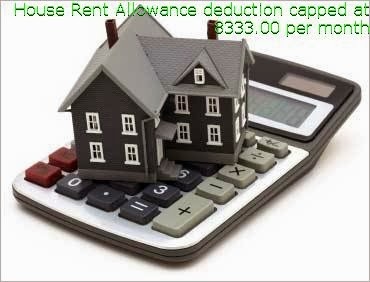 275/192/2013-IT(B) dated 10.10.2013 if you are a salaried and claiming HRA (House Rent Allowance exemption and the rent paid by you is more than Rs.1 Lakh per year then it is compulsory to provide PAN (Permanent Account Number) of your Landlord or a declaration duly signed by you and the landlord. This makes it compulsory on your part to give the PAN number of your Landlord the the Drawing and Disbursing Officer (DDO) or the Tax Deducting Authority if you are paying rent of more than Rs.1,00,000.00 per year. Earlier the limit was capped Rs.15,000 per month which meant that if you paid upto 1,80,000.00 per year, you were not required to give any PAN details about your landlord. Now the limit has been capped to Rs.1,00,000. 00 per year which make the limit of Rs.8,333 per month. This move from CBDT has a two pronged effect. One is curb those who claim the HRA benefits when they still live in their own houses. The other is to bring the landlords under the income tax dragnet given the obscene amount they take as rent in the Metros but do not disclose the same in their own returns. The problem become more acute for a Tax payer in case the landlord refuses to disclose the PAN number to him. Though the circular states that in case a landlord doesn’t have a PAN, then a declaration needs to be filed by the employee by declaring the name, address & details of landlord. But it also notes that the same has to be be duly signed by landlord. The circular also states that in case a landlord’s rental income is assessed in Income Tax then he’ll not refuse to provide PAN. But if the landlord refuses to part with his/her PAN No. or signature you have no option but to leave your current apartment and find out a new landlord who provides PAN or not claim the HRA benefit at all.